The Conscious Shopper offers up some tips for battling picky eaters. I hate that question. I dread it. I avoid answering it at all possible costs. Because I know what the response will be. "I don't like ____ (fill in the blank with most vegetables, some fruits, anything with tomato sauce, anything slightly spicy...really anything that doesn't get its main flavor from cheddar cheese)." And then the next comment is always an emphatic, "I'm not going to eat it!" And thus begins the daily dinner battle. My older boys launch Missiles of Mass Complaining at me from the opposite end of the table while I deflect their attacks by pretending not to hear. Sometimes I launch back my own missiles of Mommy Says So. 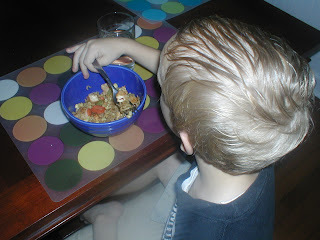 My youngest tries a different tactic - if he doesn't like the food, he throws it on the floor. My oldest is almost six, so I have been fighting the daily dinner battle for approximately five years. But since I started feeding my family a healthier, seasonal diet, the battles have increased in frequency. More leafy greens and more fruit and vegetable variety has meant more and more Missiles of Mass Complaining. Over the years, I have lost many, many battles. But I've also learned a thing or two. So for other mothers in the dinnertime trenches, here are the battle plans that have worked for me. My doctor says that you shouldn't use food as a reward. This is good advice unless you are the desperate mother of the world's pickiest eater, so I chose to ignore him and turned instead to the wisdom of mothers past....If you don't finish your dinner, you don't get dessert. If the dessert bribe is all it takes to get your picky eater to eat his broccoli, I say go for it. Just make sure you keep your daily dessert small and relatively healthy - a square or two of chocolate rather than the whole bar, a bowl of fruit with a small scoop of ice cream rather than a triple banana split. A friend of mine helped her three-year-old overcome his apprehensive eating habits with marshmallows: if he finished his meal, he got a marshmallow. Just one, but that was enough to motivate him to eat. My boys are not so easily persuaded, and I would have given up on the bribe reward tactic if I hadn't hit on the perfect reward: Mommy Fun Time. Apparently, my boys would forgo a whole bag of marshmallows rather than eat a bite of spinach, but they will gobble down an entire plate of spinach plus some collard greens if it means they get to spend fifteen minutes playing with me after dinner. My husband thinks this is hilarious because they spend all day with me anyway. I say, Don't laugh in front of the boys - you'll tip them off and then it won't work. Battle Plan #2: Give them choices. My time is valuable. Dinner takes a long time to prepare, so there's no way I'm making separate dishes for every person in the family. But at breakfast and lunch, we go a la carte. Do you want granola or a muffin? What do you want in your granola: a banana, blueberries, or strawberries? I require the boys to eat a fruit and a vegetable at lunch, but they each get to pick what kind. And I've found that as long as they get to choose, they'll happily eat it. Battle Plan #3: Be flexible. I buy most of our produce fresh and in season at the farmer's market, but I always keep a few fruits and vegetables on hand year round regardless of season: bananas, avocadoes, carrots, and celery. I also buy canned pineapples and occasionally some mangoes. I would rather buy all of our produce at the farmer's market, but these are fruits and vegetables that I know my kids will eat so I'm willing to be a little flexible. :: There will come a time in my children's lives when they will be offered a food they don't like, but it would be rude not to eat it. Maybe they will be invited over to dinner at their boss's house. Maybe they will be meeting their future in-laws. Regardless what the situation is, I think it's important to learn the skill of being able to eat something even if you don't like it. :: Children's food preferences change over time, and how will they know one day that they really do like kale if I don't keep offering it to them? Take tonight, for example. I made a simple stir-fry of vegetables, noodles, and tofu. I've made this dish many times before, and every time, it's been served with a side of the usual complaint: "I don't like tofu! I'm not going to eat it." But this time, they took their plates silently as I gently reminded them that they had to eat it if they wanted Mommy Fun Time. They poked the tofu. They sniffed it. And then they ate it. All three of my boys scraped their plates clean. Now if only I could figure out how to win the Daily Bedtime Battle. What strategies have you used to win the Daily Dinner Battle? I had three picky daughters. My mantra was 'I don't care if you like it or not,just eat it.' If they didn't eat it by the time the grown ups had finished, the plate was removed,table cleared and dinner over. The girls quickly decided that it wasn't totally gross and they could manage some of it. Mostly dinnertimes were fine and we always mixed the hated foods with things that they loved so we weren't totally mean. They survived and quickly got the message that we all eat the same food at the same time,finish! Oh you are good!! My kids won't eat greens unless they're on a pizza or in lasagna or something like that. For us, giving choices has been a big help. I do like you do for breakfast and lunch. For dinner, it depends. If there's not vegetables in something (e.g., homemade pasta sauce with tomatoes, carrots and onions or a heavily topped pizza), we often do a burrito or spring roll bar. I put out loads of fresh veggies and other ingredients and then give them a choice. They have to include one vegetable every time they make a spring roll or burrito (small tortillas). Often, they surprise me and choose two or three. Fruit is never a problem, fortunately. Thanks for the great tips. We've come up with a few rules recently. We refuse to become short-order cooks. However, I won't be like my parents, who tied me to a chair with an apron to eat my tomatoes--which I still won't touch raw! 1. You have to try a bite of everything - and not just put it to your lips - before you get seconds on anything. 2. If you refuse to eat lunch, it goes back in the fridge for snack. 3. If you're hungry after dinner, you can have a granola bar, but that's it. If you're still hungry, you should have eaten more dinner. Sounds rough, but attitudes are already changing! On a nicer note, I actually picked up a tip recently - offer a new veggie both cooked in a dish and raw. Later when we were a little older if you tried a bite you could get up and make yourself a peanut butter sandwich. And generally no dessert if you didn't eat your meal, but you weren't forced to sit at the table and the plate didn't return at the next meal. Plus dessert was pretty simple -- fruit, pudding or one scoop of i.c. With my niece, if she helped me cook it, she will at least try it. I think getting her involved in the kitchen has really helped with getting good food in her. If it was up to her, all she would eat is Taco Bell beans and nachos! YUCK! we have constant battles with dinner time. Ours are more about actually coming up to the table to eat, not too much about what's for dinner. To avoid my three year old not eating what we make, him and i talk about dinner, hours before. We spend the whole day (minutes at a time of course) decided what ingredients to cook with and how to cook or not cook them! This has helped out so much! He's usually to busy with his dad to help me make dinner, bt i find that helps too! Luckily our son hasn't discovered the world of desserts yet, we'll save that if times get really tough! @Chris in England - I'm hoping that as my kids get older, they'll understand our eating policies and there will be fewer battles. Like you, we try to mix up foods they hate with foods they like. @Farmer's Daughter - Isn't it great to be a grown-up and get to decide what you do and don't eat? @Green Bean - I like your idea for burritos and spring rolls. I need to give those spring rolls a try! @Robbie - We have your rule #2 around here also. But half the time I forget that I've put their lunch in the fridge, and they of course don't remind me! @LisaA - I'm planning on trying that tactic about getting the kids to help with the cooking. I picked up a couple of "cooking with kids" cookbooks. We'll see how it goes! @Tanya - That's a great idea to get your son so involved with the meal planning. @Green Resolutions - I like the idea of Food Chaining. We'll have to give that a try. We didn't introduce cheddar cheese flavor until vary late in the childoohoods. If your whole world is fed by zuke slices, you eat zuke slices ... not being the very BEST cooks, we sometimes put us all through some very trying meals ... but everyone grew up on what there was, so at least it wasn't poisonous. We were poor -- but we always gardened. As an old lady I met on the street once said: "You can live very cheap, but you must try!" Substitute "healthy" for "cheap" -- or least marry them to each other -- and there ya are. I used to say: "what would you like to eat?" Now I say: "It's time to eat!" I used to say, "Oh,___ fill in the blank." Esme, I like how you think! I love all of these suggestions - am hanging on to them for the many more meltdowns to come! @Risa - Sounds like that lady you met was very wise! @Robbie - Completely agree! With so many great suggestions, I feel ready to take on many future dinner battles. Life - The longest running infomercial.